Naïa is situated at Mile 17.5 on the Placencia Peninsula in southern Belize, just south of Maya Beach and north of Seine Bight village. Naïa is a 15-minute drive from Placencia Village and its airstrip, which is a 30 minute light aircraft flight from Belize International Airport. The 19 acre resort is part of the ‘Cocoplum Resort Community’, a private 200 acre reserve. Naïa has 35 air-conditioned beach houses, 10 of which have private pools and range from studios to 3 bedroom beach houses. All feature modern conveniences including wireless internet access, large flat-screen Smart television, Bose sound system with docking station, wet bar, mini fridge, coffee making facilities and U.S. compatible electrical outlets. The spa boasts 5 private treatment rooms and a private island couples suite, plus a fitness centre and Yoga & Movement Studio. Resort amenities include two saltwater pools, a water sports area with a custom-built dock, kayaks and paddleboards, three restaurants and access to world-class marine and terrestrial attractions. Each Beach House provide a home from home vibe – designed to feel like a private residence and with all comforts and modern conveniences. 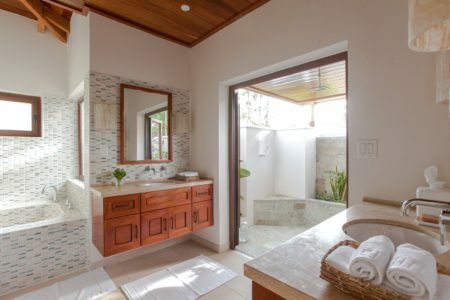 From the custom-made, locally produced artisan furnishings, to the Naia Spa inspired Citrus Nectar bath amenities to the fresh coffee beans and plunge pot on your breakfast counter, you’ll find that Naia ups the anti in the details. 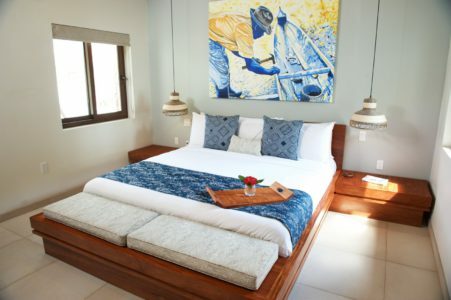 With a choice of Beach front or beach view, the Studios offer 650 square feet of space and including a private outdoor veranda with direct beach access, King bed with 100% cotton Matouk sheets, en suite bathroom with indoor deep-soaking tub, his and her vanities and a lush tropical outdoor garden shower. Available with or without a private outdoor plunge pool, the spacious 840 square foot Beach Houses showcase all of the amenities featured in the studios, along with a separate living room and sit up bar for more lounging. With generous outdoor decks with private plunge pools, direct beach access and space for alfresco dining, the Two-Bedroom Beach Houses are perfect for a family or those needing a little extra room. With 2670 square feet of space, fully furnished kitchen and a private pool, these Beach Houses provide all the comforts and space of home, with unobstructed views of the ocean. 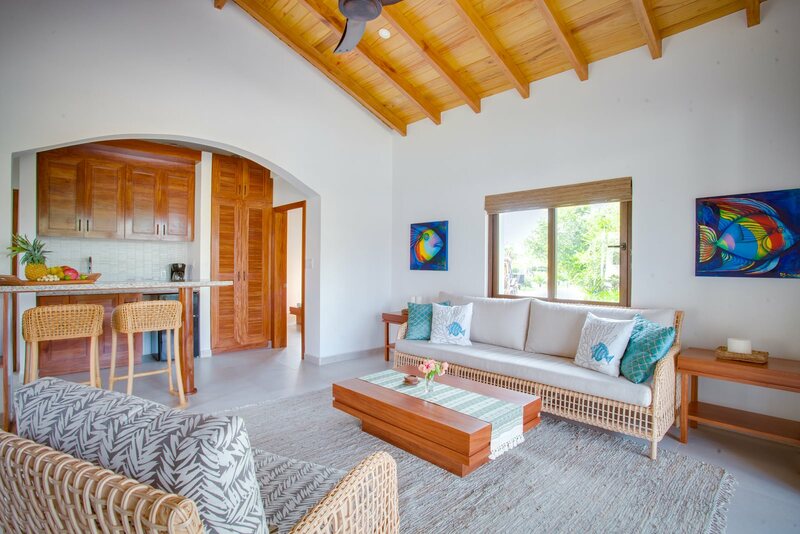 The 3000 square foot Beach House features expansive living space adorned with Belizean hardwoods, an outdoor deck with private plunge pool, direct beach access and outdoor dining for six. The 3 on-site restaurants all feature waterfront settings and menus that showcase the very best of local cuisine, using thoughtfully-sourced, seasonal ingredients with bright and natural flavours. The Spa Café leans towards the healthy and rejuvenating and includes fresh fish, colourful salads, healthy wraps, made-to-order juices and power shots. Since you are on vacation, for those looking for a little indulgence will also find a small selection of alcoholic beverages, including local beer and crisp wines. The Beach Bar & Grill is a fun hangout spot besides the pool and has a well executed list of favourites, such as seafood, burgers, tacos and salads. Named after the year that Belize attained independence, 1981 is the signature on site restaurant and offers a modern take on fresh Belizean cuisine combined with inventive mixology and a well curated wine list, in a polished yet relaxed surround. Don’t miss the chargrilled octopus or Garifuna Seafood Sere! A trip to Placencia isn’t complete with checking out some of the fantastic culinary offerings, ranging from the local shack fast food bites to the international gourmet. Here is a short list of our favourites. Located a short distance north, Maya Beach has won plenty of well deserved awards in a casual beach front bistro setting. Lobster brioche bread pudding? Shrimp stuffed squid? Or a classic fish n chips with a crisp sauvignon blanc? This place has it all! In the centre of Placencia Village, Rumfish Y Vino is a gastro-bar offering in-house infused crafted cocktails, inventive smalls plates as well as a menu of great classic comfort foods that combine Belizean twists and international fusion fare. Hungry? The braised Short Rib Lasagna is to die for, as are the ‘mix n match’ tacos. AB’s favourite is the smoked mackerel dip, with yellow ginger, red onion, cilantro with crostini. And the ginger mojitos are a must! For a true local ‘feet in the sand’ dining experience head to De Tatch Bar, on the beach in town. There are specials every day which include an abundance of local catch, combined with tropical Caribbean flavours….. and BBQ, when in Belize don’t miss the BBQ. ‘The’ Fry Jack Stand isocated near the only bus stand in the village. Don’t miss trying the local favourite fry jack, popular for breakfast. Fry jacks are tortillas, stuffed with your choice of filling (egg, cheese, ham, beans, bacon or even shredded chicken, your choice! ), sealed and deep fried. Perfect before a day of adventure on the water! At “Tutti Frutti” Gelato, located in the plaza close to Rumfish Y Vino in the village, you will find dozens of inventive flavours made in house, served in a cup, cone or even over coffee. Rates range from USD $295 per night to $1,100 per night plus 9% tax and service charge based on your choice of accommodation, the time of year and number of people in your party. There are also some seasonal special offers and great deals to be had at certain times throughout the year, so contact us for details and specials! A stay at Naia can of course be tailor made into a customised package to include adventures, experiences and all logistics. Our stay at Naia was absolutely amazing. The grounds are beautiful and well kept, all of the staff were very friendly and most came over to introduce themselves. Our room was great. 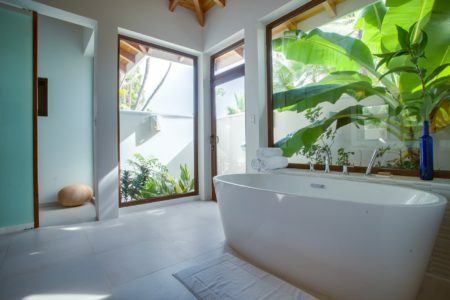 The layout of the villa was perfect with large front windows, large bed facing outside, a patio, a kitchenette, separate vanities, and a large outdoor shower. The food at the restaurant was delicious and the atmosphere was perfect. Naia has a large beach that you can stroll up and down that the staff works tirelessly to keep looking perfect, as well as a pier with a gazebo and hammock at the end to sit out on. The spa was gorgeous with individual treatment suites overlooking the mangrove ponds and the services were very reasonably priced. 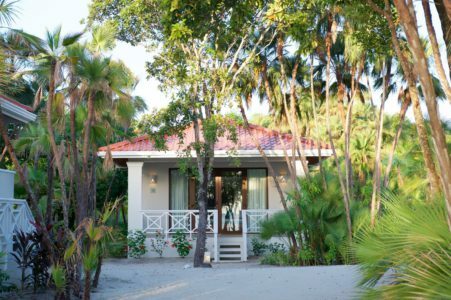 We would highly recommend this resort and will definitely stay here again when returning to Placencia. My husband and I stayed in a one bedroom beach view villa with private pool for 3 nights. This brand new hotel is beautifully done with a laid back, welcoming feel. We loved reading and relaxing on the dock, using the kayaks, and visiting the gym and spa. This is one of the most beautiful settings for a spa – each treatment room is set on its own little island on the lagoon connected by footbridges. The staff was extremely warm and friendly. The food at the pool-side restaurant is great but be sure to ask for the spa menu too (dishes on the spa menu can be prepared pool-side as well). We enjoyed fresh smoothies and juices every day. The 1981 restaurant (open for dinner only) is incredible. We wanted to check out the town the first night but once we tasted the dishes at 1981 we wished we had eaten there every night. I got a very warm and friendly welcome from the front desk staff (you will love the welcome drink! ), great customer service! Loved the beach house (beautiful artwork, spacious, welcoming, really comfortable bed, very nice patio furniture) – The food was awesome, the smoked fish dip is a must. This is a great place to have a truly relaxing retreat!